There is an old cartoon which has as its strap-line “I can’t come to bed. Someone on the internet is wrong.” I am sure you will have seen one of the many versions of it. Last year I did not write one single comment about either Brexit or the US elections. For me these are conversations worthy of deep reflection, but on social media it just seemed that so many people had either fixed positions or were writing with so much emotion, it just was not worth it. So I wrote nothing. I am almost embarrassed to admit that last year was pretty good on a personal and work level. My attitude therefore was to not let other people’s turbulent emotions impact on my own, while at the same time still offering some kind of inspiration and encouragement. Indeed, if you are following the Brazilian situation, as I wrote about in my most recent article, last year was quite amazing, with many of the powerful corrupt being charged successfully and put in prison (Was 2016 so Bad in Brazil?). However, while there continues to be much emotional turmoil, there also continues to be a growing transition of consciousness, and an deepening awareness for new styles of leadership to replace the old, outdated modes of thinking. Finn Jackson calls these accelerated times of global change “the churning” and his new book explores how to create inspiring leadership in these difficult times. The Churning refers to the “volatility, uncertainty, complexity and uncertainty that exists both in the outer world of physical events and to the inner world of our imagination and emotions”. This book therefore is dedicated to the inner aspects of leadership, with a future volume dedicated to business execution and results. Clearly both aspects of leadership are important, and so this first volume focusses on understanding, managing and generating the emotional responses we want. I have to say I am absolutely no fan at all of business books which major on step processes, you know the types I mean – seven steps to financial success etc. While The Churning does indeed have steps, these are very much not of the type I am referring to. This is a book which is easy to read but demands a deep level of engagement, with each ‘step’ consisting of a number of detailed and clearly explained reflexive exercises, leadership tools and valuable advice which comes from Finn’s many years in high-level strategic and leadership positions. To therefore aid the learning journey, the book also comes with a companion workbook, which can be either downloaded for free or which can be purchased as a physical book to write on and make notes. Not only does Finn have a wealth of business leadership experience, he has also lived the lessons he is teaching. Finn also shares his personal challenges he has faced, and this really helps the reader to appreciate more keenly the lessons being taught. Are you now clear on the values you admire in other people, what they love that you love them for loving, the types of achievement you admire, and what you see as flaws in other people? These are extremely deep and sensitive reflections, which require huge amounts of courage and humility of they are to be answered honestly. 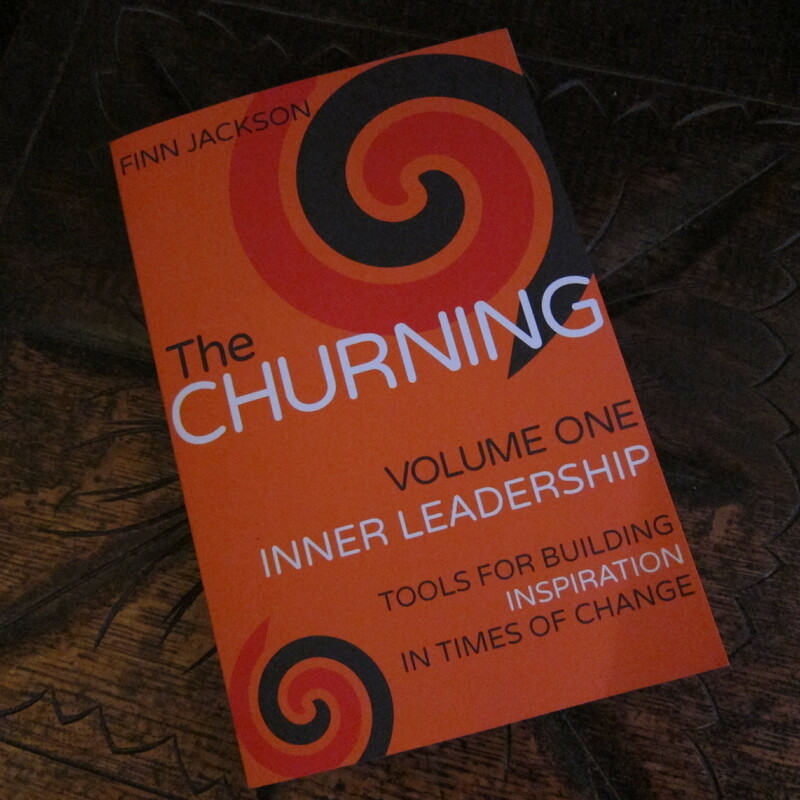 The Churning therefore is a book which can be worked through one section at a time not only independently, but also with a coach or as part of a support group, with people who can hold the space for honest reflections on the current inner state of churning and the desired state of inspirational leadership. Anyone who has the courage to step up into a position of leadership will more often than not receive just as much criticism as encouragement and praise, and for this reason it was great to see that the final step is one of “preparation for the journey” with Finn identifying three phases of transition. As he concludes, the new leaders will be ‘antifragile’ – allowing them better able to navigate this churning era we are living in. The Churning will appeal to two broad groups of people. Those who have decided to up their game and step up to the challenge of developing 21st century leadership skills where values and vision matter more than posturing and controlling behaviour. It is a rich compendium of extremely practical exercises and guidance which offer invaluable advice for those who are willing to commit both time and emotional energy to their personal transformation. It is also a book which provides as well-proven and clearly-structured development course for consultants, coaches and HR professionals who are looking for a clearly articulated leadership training programme for clients, trainees and personnel alike. ← What’s New for Capra Course in 2017?